Hallmarked Kiev 1899-1908, this 84 zolotnik silver (87.5% slide originally decorated a boy's belt. We have hung it on a sterling silver chain to make it a pendant. The black decoration is permanent t and is called niello. I have not been able to identify the maker GG in Cyrillic. The slide is 4.5 cm long. Hallmarked Kiev 1899-1908, this 84 zolotnik silver (87.5% slide originally decorated a boy’s belt. 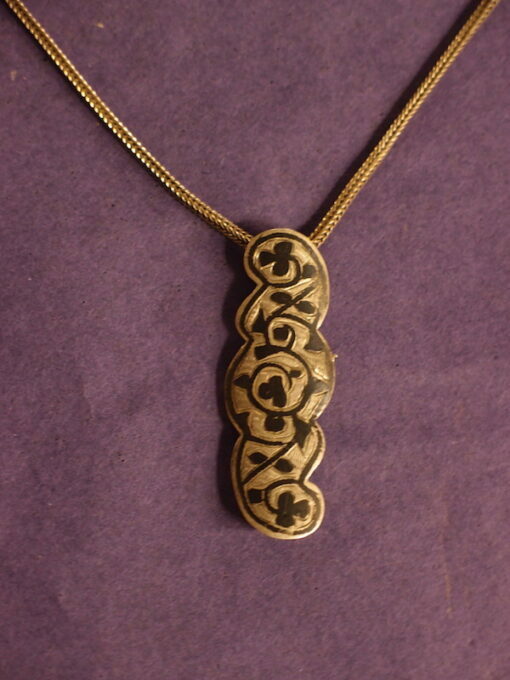 We have hung it on a sterling silver chain to make it a pendant. The black decoration is permanent t and is called niello. I have not been able to identify the maker GG in Cyrillic. The slide is 4.5 cm long.